휴, 베트남의 휴 백팩커스 호스텔 | 호스텔월드에서 예약하세요. 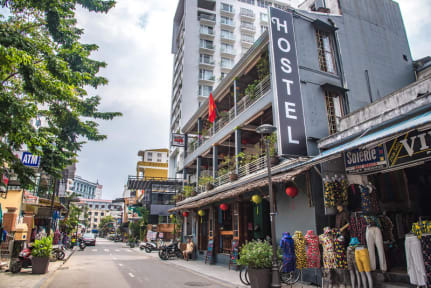 Vietnam Backpackers Hostels - Hue is housed in a beautiful, colonial building with sweeping verandas perfect for kicking back with an ice cold beer. Our awesome downstairs Sports Bar has killer events, DAILY happy hours, and is the perfect spot to meet some new mates and head out to explore the historic Imperial City. Our travel desk in Hue offers a huge range of tours and experiences in the surrounding area and is happy to help plan any onward travel both north and south from the midpoint of the country. Feel free to speak to them about anything from local daily recommendations to full country itinerary planning, including a visit to our hostels in Hanoi and Hoi An; an escape to paradise at our resort, Ninhvana; a visit to our newest Backpacker Village in Mui Ne, and a stay in our lively Saigon hostel; rural countryside adventures in the North AND of course, the infamous Castaways Island trip in Ha Long Bay! We look forward to showing you an unforgettable stay in Hue and throughout your travels in Vietnam!